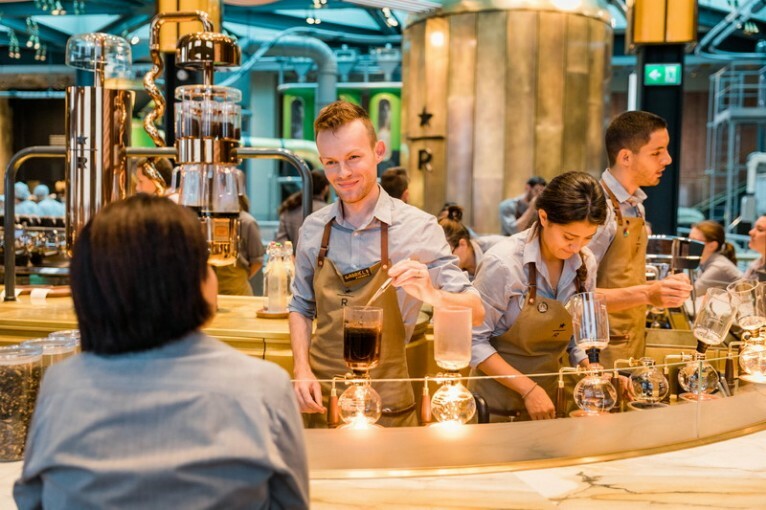 The new Starbucks Reserve Roastery in Milan opens today! Is an intricate masterpiece of Italian craftsmanship and coffee innovation. 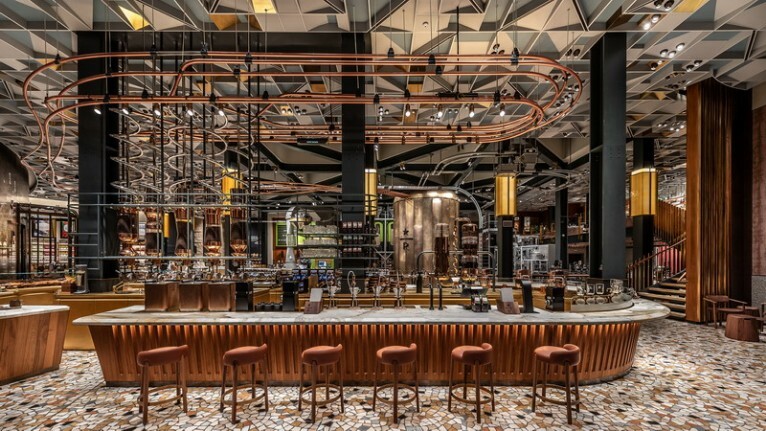 The marble and brick, the twisting copper pipes and blossoming bronze roasting cask, the cascade of sounds and vibrant colors and changing light – where to even start? Don’t worry. We’ve got you. 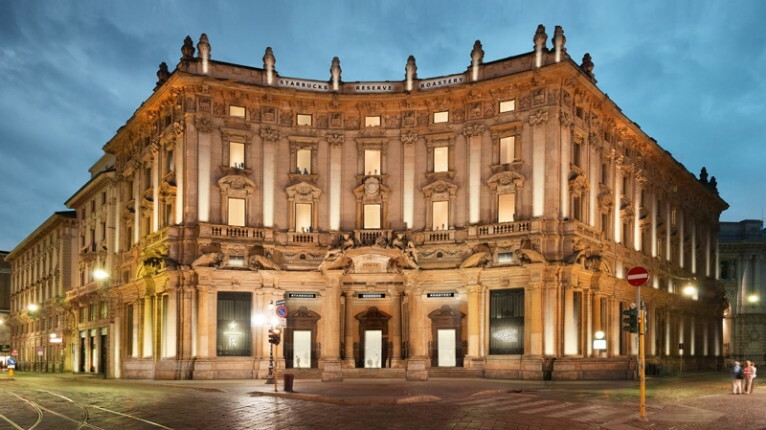 Here are 10 initial things to look for in the new Milan Roastery. 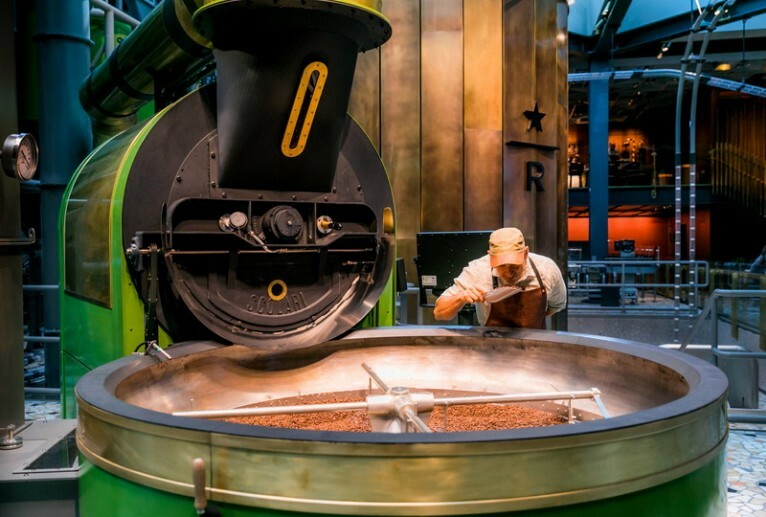 Milan is the third Starbucks Reserve Roastery in the world (the Seattle Roastery opened in 2014, and Shanghai in 2017) but the first where customers can move all the way around the bright green Scolari roaster (made in Italy, by the way) and watch every step of the coffee roasting process from bean to cup. 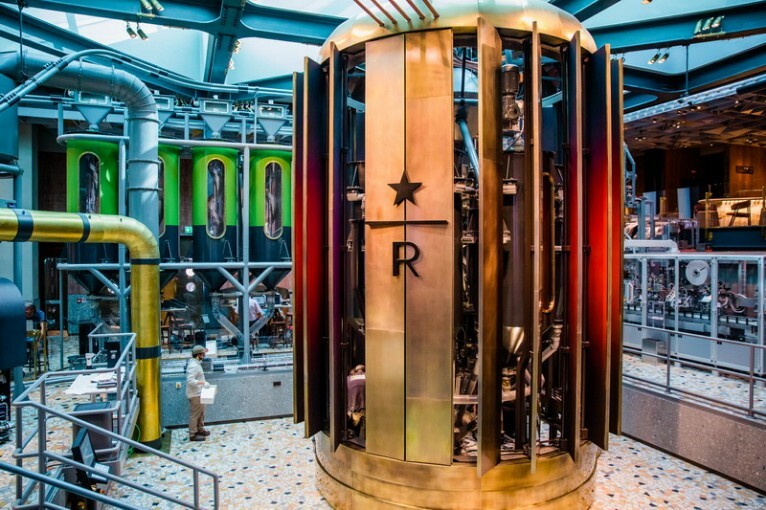 The epicenter of the new Roastery is a 22-foot, first-of-its-kind bronze roasting cask that periodically unfolds and rotates, like a blooming flower, to give customers a rare glimpse of the de-gassing phase of the coffee bean roasting process. 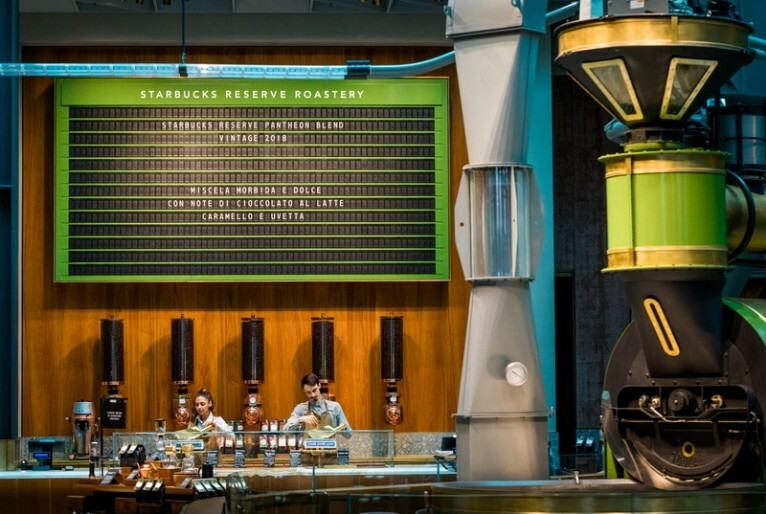 While the Seattle and Shanghai Roasteries used rich, dark tones, the Milan Roastery is an explosion of color, including marble in jewel tones and a roaster and clackerboard display in a distinctive, vibrant green inspired by the coffee card for Starbucks Reserve Ethiopia Kayan Mountain Farm. 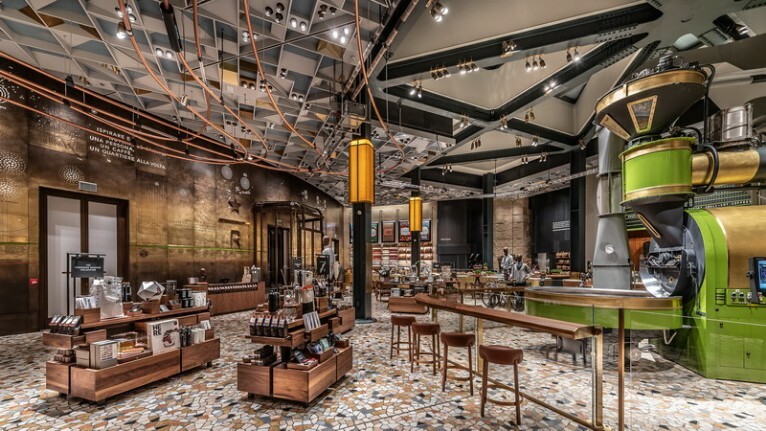 The entrance wall of the Roastery features a floor-to-ceiling, engraved brass story of Starbucks. 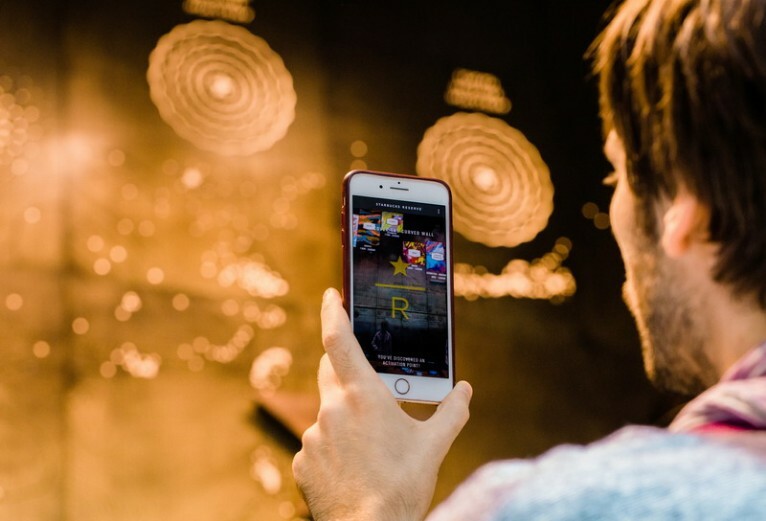 Guests can view the wall as it is or, with the help of their mobile device, can experience the wall in augmented reality (AR), giving them access to even more multimedia artifacts about the company’s history and the art and science of coffee. 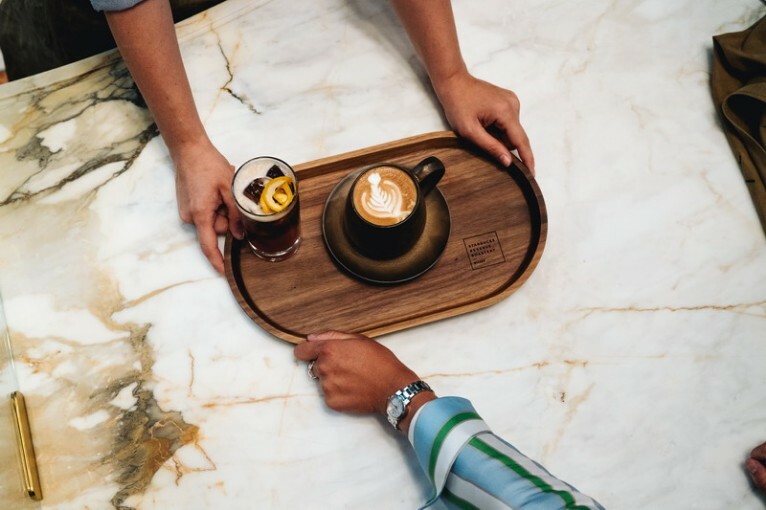 In a nod to the marble countertops featured in espresso bars across Milan, all of the bars in the Roastery are marble and warm to the touch, thanks to radiant heat inside. They were carved from the same 30-ton block of Calacatta Macchia Vecchia marble from a Tuscan quarry. 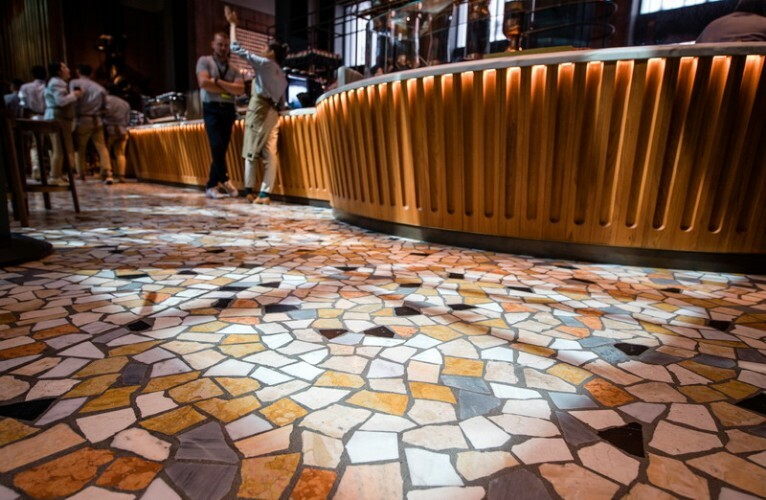 The Roastery’s stunning mosaiced marble floor is handcrafted in the traditional Palladianan style, while its geometric ceiling was designed and engineered digitally, creating a floor-to-ceiling blend of history and future. 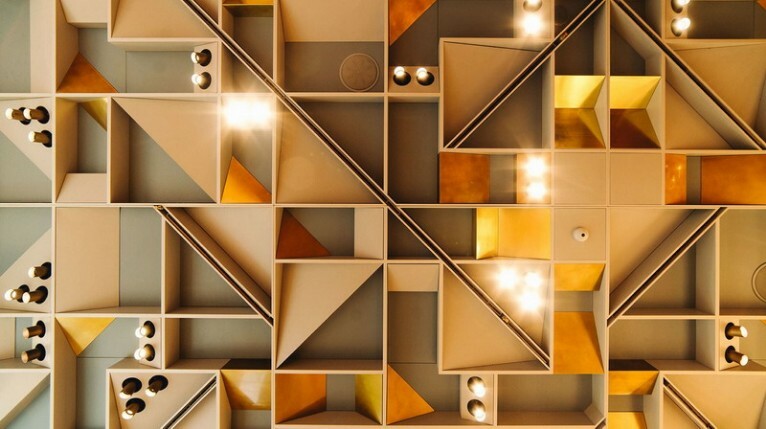 On the Roastery’s mezzanine, up a sweeping staircase, is the chic Arriviamo Bar. 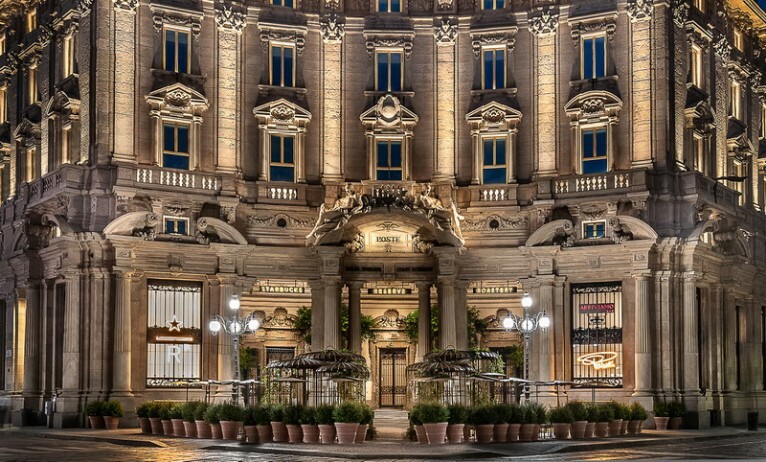 Inspired by the tradition of the Italian aperitivo, early evening social cocktails paired with small bites, the bar features more than 100 cocktails with new creations and traditional favorites like the Negroni and the Aperol spritz. 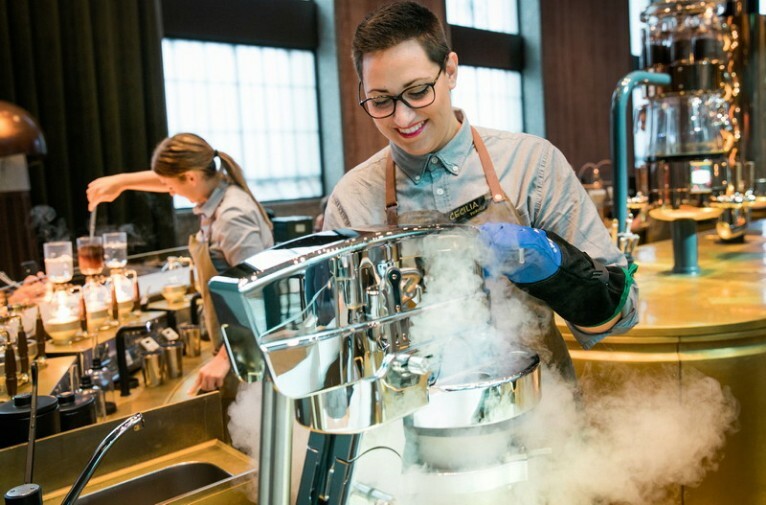 At the end of the Roastery’s main coffee bar on the ground floor is a theatrical mix of food and beverage that partners have dubbed “Fire and Ice.” A line of siphons with glowing flames for brewing coffee sits next to an affogato station creating ice cream with liquid nitrogen, generating clouds of puffy, white vapor with each hand-crafted batch. 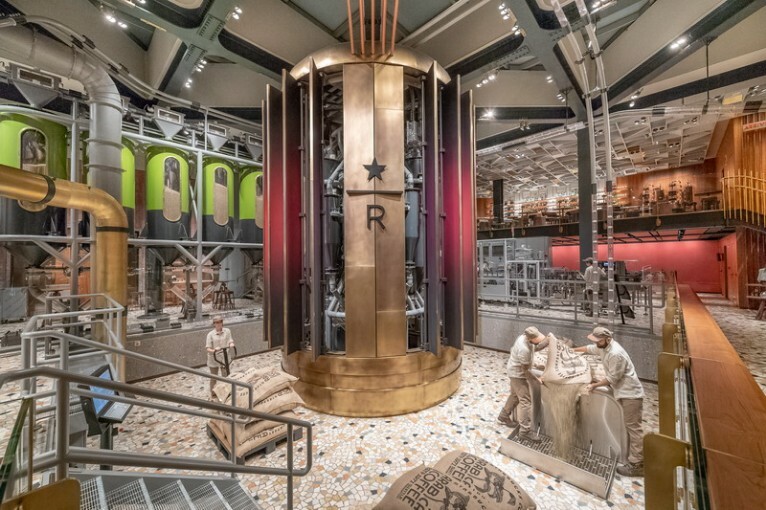 The Princi Bakery in the Milan Roastery is anchored by a wood-fired oven, made brick-by-brick on site – local baker Rocco Princi’s ultimate tool for making bread the way it’s meant to be done. Outside on the Roastery’s distinctly European terrace, customers can enjoy the full range of Roastery coffees, cocktails and cuisine. 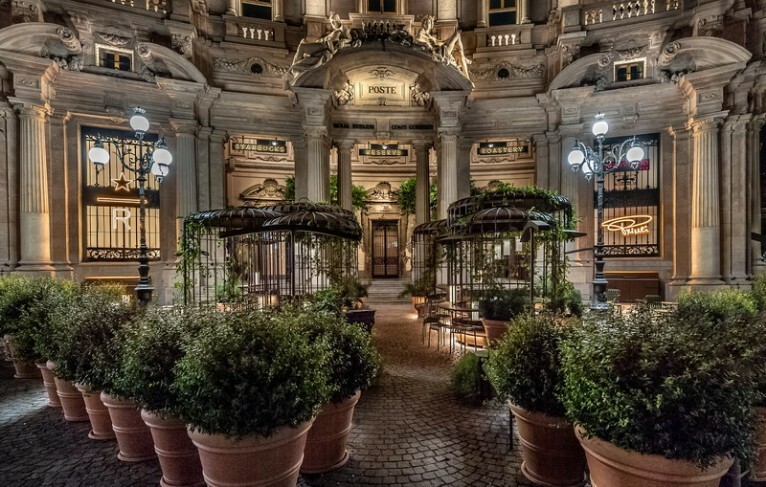 As you make your way out to the leafy, street-side café tables on the terrace – some of which sit in giant, bronze bird cages – be sure to look for the stunning statue of the siren in the portico, hand-carved from Carrara marble by Tuscan sculptor Giovanni Balderi.